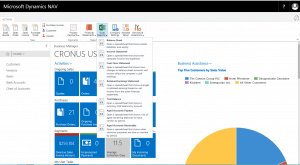 What’s New in Microsoft Dynamics NAV 2018? » Managerial » What’s New in Microsoft Dynamics NAV 2018? The 1st of December is the launch day of Microsoft Dynamics NAV 2018. 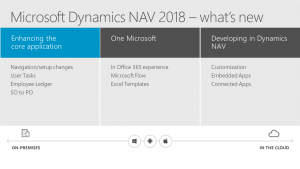 There were lots of rumors about new Dynamics NAV version, as we remember, but finally, the new Dynamics NAV 2018 is here and let‘s shortly review it and get some insights from Simplanova team about NAV 2018. 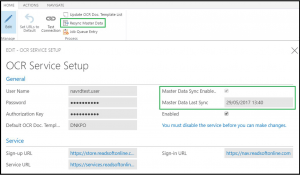 You can find more information and download Dynamics NAV 2018 here. In Microsoft Dynamics NAV 2018 we will see deeper integration of Dynamics NAV and Microsoft products by connecting them with each other in the same business environment, such as Dynamics 365 applications, PowerApps, Flow, Office 365, Power BI and third-party applications. From the vision of Microsoft, we can see that the goal of integration is to offer full software package to a small and mid-size business. 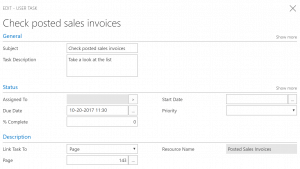 Connect to your Dynamics 365 for Sales solution in a few easy steps. The assisted setup helps you synchronize your data across the two apps, including sales orders, item availability, units of measure, and currencies. 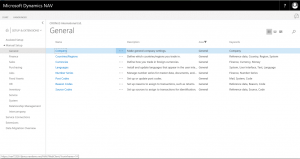 The existing integration with the app formerly known as Dynamics CRM has been rebranded and simplified to work better out of the box. Dynamics NAV 2018 has a new, modern, state-of-the-art extensibility model which will enable to extend and customise clients’ current Dynamics NAV solution to further fulfill their business needs. Totally new features in Dynamics NAV 2018 include Microsoft’s Cognitive services. These services use advanced algorithms which allow users to amalgamate artificial intelligence into the applications. Automatic facial, speech and language recognition can be employed in HR contexts and automate procedures. Product recognition places items in the correct categories by providing much more automatization in product management. The Image Analyzer extension uses powerful image analytics provided by the Computer Vision API for Microsoft Cognitive Services to detect attributes in the images that you add to items and contact persons, so you can easily review and assign them. Contact persons Recognize a person’s gender, or age. Items Identify attributes like type and color. For example, whether it’s a table or a car, or red or blue. Image Analyzer suggests attributes based tags that the Computer Vision API finds with a confidence level. 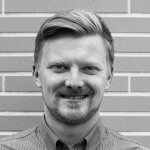 “Extensions will bring a whole new level to Dynamics NAV solution, this is one of the long waited functionality by both customers and partners. While we believe that it is currently still very limited, it holds a bright future for further developments in NAV. Having this in mind, we see NAV 2018 as a bigger leap and thus worthwhile upgrading now comparing to the NAV 2017 solution, so we expect to see more customers converting after December 1st. – says Petras Butenas, CEO Simplanova. You can now import payroll transaction files in the QuickBooks IIF format by installing the QuickBooks Payroll File Import extension. Aggregated payroll data, including date, payroll account, description, and amount, will be imported to your G/L accounts according to mappings that you perform once per payroll account. The extension also contains a sample payroll file that you can use to try out the functionality, for example, in a demo company. To empower developers and service providers to easily integrate with Microsoft Dynamics NAV, Microsoft is adding a REST API based on web services with easy-to-use authentication. The entities in the API can be used on their own or in combination with extensions when there is a need to add user interface elements or business logic Dynamics NAV. The first iteration of the API publishes common record types, including company information, customer, vendor, employee, item (product), sales order, sales invoice, account, and journal. Take advantage of vendor synchronization when using Lexmark ICS. 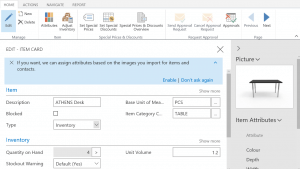 This will improve the vendor recognition rate in the Lexmark ICS and allow manual selection of vendors when performing visual training of new invoice layouts. Vendor information including number, name, address, VAT registration, phone, and bank account data is transferred to Lexmark ICS when synchronizing. Personalize your workspace directly in the browser! Personalization is now enabled by default for all. To get started, find the Personalize menu item under your sign-in avatar in the upper right corner. As you make changes, they are immediately saved and only seen by you, even if you sign into the browser or app from another device. Move, hide, or show a field on the page. Move, hide, or show a column on the page. Freeze columns to keep them visible while you scroll, just like in Microsoft Excel! Move or hide parts, such as Factboxes or Role Center parts. Clear personalization from a page and start fresh. For IT administrators, we’ve also added the ability to deny personalization to groups of users from the Profile page, or clear personalization from all pages or a specific page for a user. Until now, previewing a report in the Dynamics NAV Web client was only possible in Internet Explorer, but is now possible on all supported browsers. You can preview a report directly in the client by choosing the Preview button on report request pages. This displays the report by using the new PDF Viewer control, which enables you to use your keyboard and mouse to navigate the report and download it to your computer. The report preview in the Web client has been refurbished with a new design and additional features. It works with all supported browsers. You preview a report by choosing Preview on the report options page. A toolbar provides several features for working with the report, such as zooming in and out, downloading to file, and more. Select text – This feature lets you select one or more words, paragraphs, or rows in the report, and then copy and paste it somewhere else, like a page in Financials or a Microsoft Word document. Pan the document – This feature lets you move the visible area of the report in any direction, so you can view other areas. This is helpful when you have zoomed in to see details. If you want to bulk delete all or some user tasks, you can use the Delete User Tasks report. In the request page, you can set filters to determine which tasks must be deleted. You can also post payments against employees from payment journals. On payment journal lines, there is a new account type, Employee. You can use this account type to post a payment to an employee. You can apply payments to an employee ledger entry either via the Applies-to Doc. No. field on the payment journal line or by choosing the Apply Entries action on the employee ledger entry. You can un-apply payments from employee ledger entries. Do this by choosing the action Un-apply Entries on the employee ledger entry. You can now submit EC Sales List Report with more than 9999 lines. All you need is to set a threshold on a number of lines in VAT Report Configuration for EC Sales List report in Maximum number of lines field to 9999 and we’ve got you covered. When you submit such large EC Sales List report a number of messages will be generated and sent them to Government Gateway. You can see results of submission in Log Entries. 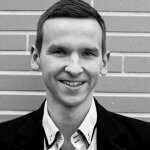 What‘s the most important for Developers? Start using/learning Visual Studio code as Dynamics NAV development will migrate to it from old C/SIDE. Start using events & subscription & Events. By analyzing all the given material from Microsoft and their presentation during key conferences, the future of Dynamics NAV is the cloud, VS Code, customization with events & web client. Now it‘s time to touch in reality the Dynamics NAV 2018 and share with You our insights in upcoming blog posts. Interested in professional Dynamics NAV Upgrade Service? – Submit the form below and we will help to boost Your Microsoft Dynamics NAV services!